I’m floating peacefully through space. Fears faced, mind sharks cast aside, I’ve plunged quite literally into a womb of tranquillity. Everything is right with the world. How? Simple, I’m in a floatation tank. Admittedly I was a little sceptical and a lot uneasy about being in a dark, claustrophobic ‘tank’. Would I sink to the bottom, struggle for air – and what if something sinister got me in the darkness? 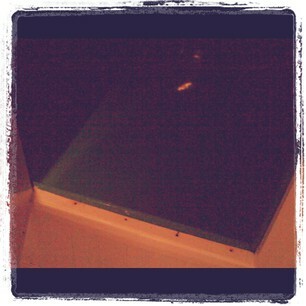 Instead, at the Rainbow Rooms, I found a calm, warm welcoming space – more like a mini pool than a tank. And I wasn’t lost in blackness – I could have low lighting on or turn it off completely. Even better, I could leave the door to the ‘tank’ opened as much or as little as I liked. And as for sinking to the bottom – not a worry; I instantly floated like a cork. Initially my thinking is jumbled. But once I relax and enjoy the experience my thoughts are fluid, lucid and calm. I contemplate trivial things – could I pull off 1930’s bob – and life things like – should I change jobs… and take up the ukulele – though possibly not in that order. There’s wonderful moments of complete and utter serenity; I simply enjoy the sensation of being suspended yet supported. King Kong scooping up Fay Wray doesn’t compare. One hour in the tank is apparently equivalent to five hours of sleep. And I believe it. Don’t shave a day or two before you go because the Epsom salted water that makes you float will sting. If you have cuts or scratches, the Rainbow Rooms provides Vaseline to prevent stinging. You can either go au natural or wear a swim costume, trunks or bikini. But remove any metal jewellery and contact lenses. Shower, shampoo, rinse thoroughly before and after you get in the tank. The Rainbow Rooms provides a private shower room just outside your private tank. There is no real wrong or right way to use the tank. Light on, light off, hands at your side or on your stomach, being still or moving around – do whatever feels comfortable and helps you to relax. If you have ear sensitivities, wear earplugs. It’s £33 a pop and worth every penny – in my opinion possibly better and more beneficial than other spa treatments I’ve tried. Keep your eyes peeled for an itison deal and, like me, you could snap up an hour of floating for a mere £11. I’ll definitely be back, deal or not. It’s been a week since I floated and I’m still feeling the benefits. My skin feels soft and supple, I’m rested and refreshed like never before, and would you believe my hair even looks better (bob still to be decided). Not sure how long this new calm me will last – but I’m savouring every moment.